Now that the wreckage of the car industry can be more clearly seen, there is ample opportunity, as the President said, to prosper by going green, cutting costs and rebuilding infrastructure. The trends in SoCal these days are easy to see. There are sure a lot of Bentleys (in all sizes and shapes), Ferraris (usually red and always reinterpreting the company logo) and, making a brilliant comeback, big BMWs. There are lots of very active players in the upscale market these days, including GM and Chrysler who would seem to have no business being there in any shape, manner or form. They were saved to stabilize the overall economy and prevent a panic, and then to . I understand how difficult it is and how many excuses there are. Simply said, it is obvious that whole nation must work together to have domestic manufacturers leading the way in green cars, and leasing their technology to foreign competitors at a fair price. At some point, with China on the horizon, manufacturing at all in the USA will . Former blue collar workers will have to be taught a little rational thinking, and former white collars are going to have to be taught a little humility. Since there are very few cars out there that are really new, and fewer still that claim greeen-ness, here are some thoughts about the basic choices. If you have a lot of money and can afford them, for God's sake don't buy one of those expensive cars. You don't need and you encourage the industry to resist going 100% green which must be their goal, and which they can by producing cars that are smart, mean, safe, quick, comfortable, auto-controlled and that come with a lifetime guarantee. Now there's a goal to be proud of. 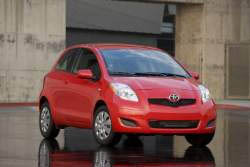 However, if you genuinely need a new car, and want to contribute to the green revolution while spending entry-level money, you can look at Toyota's Yaris, the Mini Cooper, the diesels from BWV and Volkswagen, and the Asian onslaught of delivery vans and teen machines which are ideal for everything except long-distance driving. Sitting atop the heap is the supremely competent Prius which is to say that it remains the market leader while its competition is still scrambling to catch up with the technology let alone mount an effective challenge. Priuses are comforting to see, aren't they? Tell me the truth: If you were the only one of your block or in your apartment building to own a Prius, while the rest were a combination of rusting junk and ostentatious new ones, and then, suddenly, overnight, everyone had one, wouldn't you feel really happy? Especially if they were in pastel tones and colors. My complaint? It's just a tad touch too simple to operate. I love the diesels; they're incredibly safe, luxurious, powerful and very frugal to operate. If I had to get to Pasadena to review a play and I was death-defyingly late, still stuck in traffic on the 10, I'd take a Yaris any day. Small, maneuverable, solid, speedy, small, maneuverable and cheery somehow, with fabulous gas mileage and a personality that its inventors haven't chosen, like Geppetto, to give the Prius yet. And the Yaris is just interesting enough to operate that you feel you're engaged with the road which, in LA, is a very good thing if you want to get home in one piece. 2. What's the environmental impact? 3. Who do you encourage and support by buying it? The circuit of Monza will again host the Formula 1 Grand Prix of Italy from the 10th until the 12th September 2010. The Italian Grand Prix is one of the most popular races on the F1 calendar worldwide. In 2008 it saw the maiden victory of Vettel in his Torro Rosso. In the extreme wet conditions the German took pole on Saturday and brought home the victory on Sunday. The �Autodromo di Monza� is the ultimate circuit for speed lovers. On the long straight distances the Formula 1 pilots can race high speeds. Overtaking is easy, but also very dangerous. A race on the circuit at Monza forces a lot from both the car and the driver. As a result, spectacular crashes are also known to occur. A race at the �Autodromo di Monza� guarantees annual tension and sensation. This race should not be missed by real race fans! Start ordering for the 2010 Italian GP! Experience the next generation of transportation at the North American International Auto Show 2010. See more than 700 vehicles on display, representing the most innovative designs in the world and experience North America's largest and most prestigious automotive showcase.